Where: Auffangstation für Reptilien, München e.V. 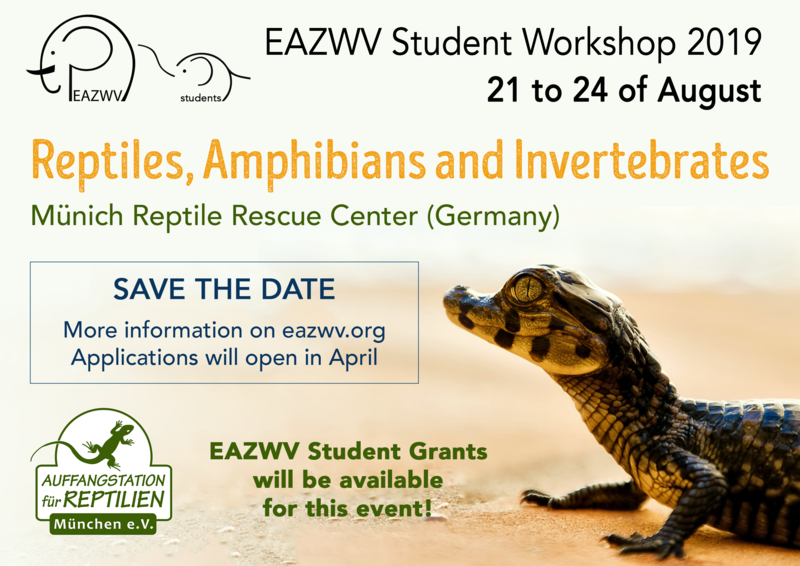 This year's EAZWV Student Workshop will take 20 under and post-graduate students to Münich, Germany, and its Reptile Recovery Centre, to expand their knowledge and skill on the Medicine of Reptiles, Amphibians and Invertebrates! Students will be able to learn from lectures and practicals run by established veterinarians, but will also be able to participate in the programme with a 10 min presentation of their own! This presentation will be based on a previously assigned scientific peer-reviewed article, and as in previous years, this successful type of Workshop allows students to practice their scientific presentation skills in a small and supportive environment that will give them constructive criticism for when they need to do it in a conference. Applications to participate will open in April for 5 days, and the link will be available on this page. You will need to submit a short CV (max 2 pages) and a cover letter. Priority will be given to EAZWV Student Members, and we will aim to have a wide representation of under and post-graduate students from different European countries. The cost is estimated to be between 200 to 300€, which will include meals and accommodation for the duration of the Workshop. Keep an eye on this page where we will soon release the date applications will open and the final cost! And finally, for the first time this year, you will be able to apply for a Student Grant that will cover the cost of registration! Applications for this grant will be open at the same time as for the Workshop, and you can find all the details right here. We look forward to welcoming you into Münich, and for any questions feel free to contact the Student Board!